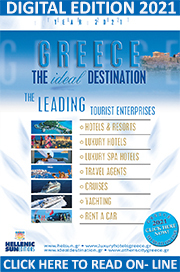 CONFERENCES, CONGRESSES, INCENTIVES, MEETINGS, BUSINESS TRAVEL IN GREECE, THE ULTIMATE CHOICE. 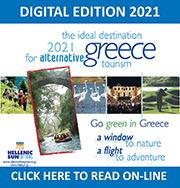 GREECE, THE IDEAL DESTINATION FOR INCENTIVES, CONGRESSES, INTERNATIONAL CULTURAL AND SPORT EVENTS. Greece, with its unique geographical position, ideal weather conditions, rich cultural heritage, thousands of monuments and sights, major infrastructure projects recently completed, the great success of major international sport (Olympic Games) and Cultural Events that took place with absolute success and security, is increasingly becoming an attractive destination for incentives, congresses, meetings, events, business tourism and more. Greece, with its incomparable advantages, its congress infrastructure, experienced P.C.Os, leading D.M.C. enterprises, the plethora of convention centers, luxury resort hotels with modern conference infrastructure, offers a wide range of choices for the organization of your next conference or any event. - Greece is the crossroads of three continents: Europe, Asia and Africa. - It combines monumental architecture, sculpture, theater, philosophy, medicine. - Unique museums and archaeological sites. Conference infrastructure with cutting-edge technology (special specifications also indoors) throughout the country. Quality services. Ideal destination for meetings and incentives. Our web page provides information for the potential and the infrastructure found in Greece as a congress destination, getting you acquainted with the leading enterprises in Greece, active in the congress tourism sector, such as P.C.O's, D.M.C's, CONFERENCE CENTERS, CONVENTION CENTERS & RESORT HOTELS, HOTELS WITH CONFERENCE FACILITIES, AUDIOVISUAL COMPANIES, INCENTIVES HOUSES, AIRLINES, CATERING COMPANIES, ORGANIZATION OF EVENTS & RECEPTION, BOOTH DESIGH & CONSTRUCTION COMPANIES, VIP SERVICES COMPANIES. Athens, Rhodes, Thessaloniki, Crete, Cyclades, Halkidiki, Corfu, Attica, Heraklion, Santorini, Mykonos, Skiathos, Greek islands, Corfu, are cities and areas presented in this web page along with all the necessary information for organizing your next conference, their infrastructure, conference centers, leading hotels with Conference facilities, leading Greek enterprises active in congress tourism, P.C.O. 's, D.M.C. 's, INCENTIVES HOUSES, HOTELS WITH CONFERENCE FACILITIES, CONFERENCE CENTERS, CONVENTION CENTERS AND RESORT HOTELS, AUDIOVISUAL COMPANIES, CATERING COMPANIES ORGANIZATION OF EVENTS & RECEPTION, BOOTH DESIGN & CONSTRUCTION COMPANIES, with great experience, know-how, planning and quality services are available to organize with personal care your conference, incentive travel, congress, your meeting in Greece at each of its islands or cities. Greece is renowned and widely established as an important tourist destination attracting millions of tourists each year. It represents an important proposal for international companies and enterprises that organize events and congresses and seek a different destination for congresses, one that is not yet saturated. Greece is the perfect place for professional travel and tourism, offering the opportunity for a successful combination of business and pleasure. 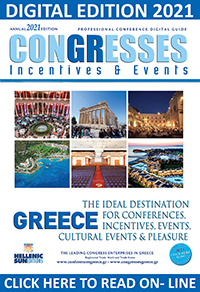 ATHENS, ATTICA, RHODES, KOS, THESSALONIKI, CRETE, MYKONOS, HALKIDIKI, GREEK ISLANDS, SANTORINI, SKIATHOS, CORFU, VOLOS, ARE JUST SOME of the destinations featured along with useful information on our web page, which you may pick for your next congress, incentive meeting, conference and more. They are looking forward to offering you their hospitality along with their personal care, guaranteeing the success of your event. In the event that you do not find what you are looking for in these web pages, please feel free to communicate with us, using the electronic form.